With ABCFamily's Switched at Birth on hiatus, a new show moved into its 9pm ET slot on Mondays this week. 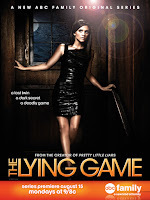 The Lying Game (not to be confused with the network's Pretty Little Liars) premiered and will continue to hold that weekly time for its first season. The show is based on novels by Sara Shepherd, who did write the Pretty Little Liars books as well. Alexandra Chando, who plays Emma and Sutton on the show, was available for a Q&A last week and we learned a lot about the show and her approach. You may be familiar with Alexandra Chando from her role as Maddie Coleman on As the World Turns. She spent five years in that role, and learned a lot from those experiences. "The soap experience was absolutely incredible. I couldn't have learned what I learned in a classroom on that set. Honestly, like the work ethic and just how incredibly difficult it was to learn 30 pages a day and film 5 episodes in a week. It really, really taught me how to take on that much work and that type of tole, and it's obviously led me to be able to get through these challenging, long workdays for sure." - "it's a little bit dark. There is definitely a lot of mystery to it, but at the same time, it has a lot of heart. It touches on romance and love triangles and relationships between parents and their teenagers. There are definitely a lot of secrets." - Her most memorable moment that had been shot to date is from the second episode. "Blair Redford and I were out on the set called The Overlook, but they used a crane shot. All you see is grass for miles and miles. It looks like we're in Africa, but we're dancing in this grass." - "Every episode ends with a cliffhanger." - Although only a handful of episodes were filmed, she has already learned a lot. "I feel like I've really learned the amount of focus and work ethic it takes to really hold up a series and maintain great work and produce good work." - The pilot was shot in December, before the novel was out. She has since read it and finds it helpful in painting a picture of Emma's past, but hasn't gotten to the second one yet. - For fans of the book, there are differences between it and the show - "if we were to just follow the book directly then there would be no mystery involved. - She thinks "a lot of the Pretty Little Liars fans will be able to get into our show as well, because we kind of have a very similar tone, if you will." - She believes that The Lying Game will appeal to soap fans - "it definitely has the tone of intrigue and mysteries... there are love triangles." - When asked what attracted her to the role, Alexandra Chando replied that she has "always fantasized" about playing two characters, and these two were "just really solid characters and I thought it would be such an interesting thing to be able to develop these two girls and see where they lead." - Playing multiple roles is "a blessing, first of all, to just have the opportunity to play two roles. To be able to develop two characters and kind of find different things about them and explore them each and every day has been incredible. It does come with challenges, though. I have 15-hour work days and I'm working an awful lot compared to what I would be working if I was just playing one character.... It's a challenge in the sense, besides the hours and the exhaustion, just trying to keep them straight sometimes." - "It's gotten a little bit easier to really feel like these characters and understand them, but there are moments where a little bit of Sutton will creep into Emma and vice versa. It's definitely been a challenge and I'd say, as well, having to act with a green screen or an eye line with an X on the wall has become easier, but it was definitely a challenge in the beginning." - In keeping track of who is Sutton and who is Emma, Chando mentioned that "hair and makeup is definitely a key element, as well as the wardrobe.... but I also think, on top of that, Sutton talks a bit differently. It's not necessarily an accent thing - she talks just a little bit differently as far as she always has a little bit of a drawl in a way. She kind of grew up in that very privileged way, so she talks in that kind of manner. Her posture is different; she's definitely a little bit more polished." She also tries to bring "a warmth" and "kind of a comedic lightness" to Emma. - She can relate to both characters. "with Emma, I consider myself a kind person, thoughtful, and I try not to take things for granted... with Sutton, I think, I relate to the way she handles things emotionally. She's less emotional. She kind of compartmentalizes things and I kind of find myself doing that often, especially in this industry and where life has taken me." - When asked if she prefers one of her characters over the other, "I love both of them. I think both of them are very interesting, very fun to play. Emma is a little bit easier to play - I can relate to her really well, but Sutton is interesting because she's a little bit more work." - When Alexandra Chando first sat down to watch the pilot of The Lying Game, she "was squirming in my seat for the first three minutes because it's such a surreal thing.... it's interesting to sit there and see yourself. It's almost as if you're watching somebody else." She does like to watch herself though, "I like to learn things. You can always learn something from a performance: pick it apart but also learn new things. Yes, I try to watch everything that I've done just to learn and grow." - Getting manicures and pedicures is kind of a guilty pleasure for her. She also loves going to the movies - she loves just "constantly stufying and just allowing myself to enjoy other people's performances." - The show is shooting in Austin, and the cast likes to explore the city together. For the 4th of July they went to a lake. - If she could pick a cast member from As the World Turns to appear on The Lying Game, she would say Jesse Soffer, as "he can really play the mystery of it. He can really play that dark character and I think it would be really interesting to see him in a show like this."